I’ve mentioned before that I LOVE little boys and how much energy they have. Trying to have a 3 or 4 year old sit for 30-60 minutes at a time at a table to do any type of activity (like speech and language therapy) can be challenging, but especially for boys (and girls too!) who are more high energy. Which is why I really try to incorporate gross motor activities into my speech sessions whenever I can. And of course, I love to incorporate gross motor activities in my own children’s days as well. This last week I did a fun one with some of my clients as well as with my own children. 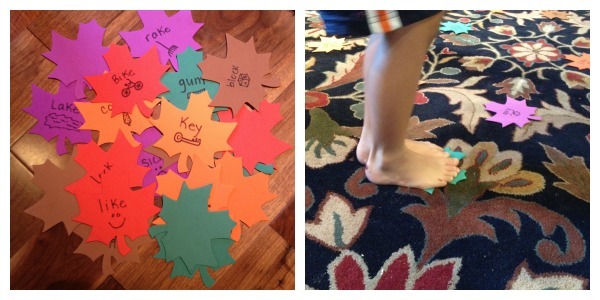 These activities are PERFECT for small groups, but you may need to move the table and chairs out of the way 😉 If you’ve been reading along for a while, you know I love activities that can be tweaked for use across with children of all abilities and with different goals and these are great examples! 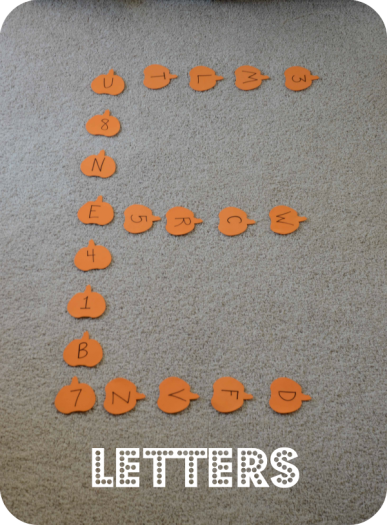 The first gross motor jump game I will share I did last week with one of my clients. I had a large pack of foam autumn leaves and we wrote the words he was working on producing on the leaves along with a picture representing each word (since he is not reading yet). We spread out all the leaves all over the room and I had him jump from leaf to leaf to get from one piece of furniture to another. In order to jump to the next leaf, he had to say each word on the leaf 5 times. He really enjoyed this game and it was very motivating for him! The next game I did with my own children. This time, I used foam pumpkins. 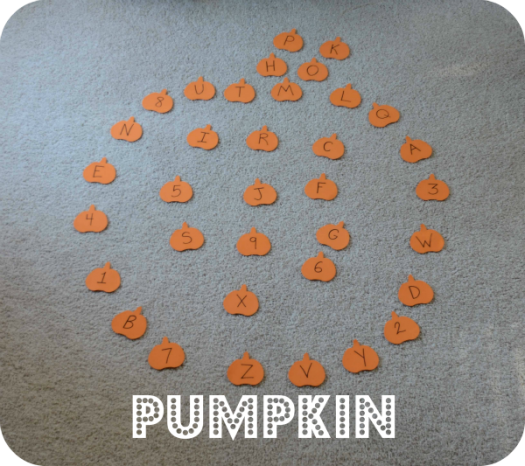 My daughter is almost 4 and is working on letter and number ID, so I wrote the letters of the alphabet and the numbers 1-9 on the pumpkins and I then spread them out all over the living room in different configurations and had her jump from letters to letters while working on identifying them. She LOVED this game, and my 21 month old enjoyed jumping along behind her and “naming” the letters as well (he called them all “E”). I wrote a post a while ago about gross motor spider web fun (original idea, in case you don’t go to other post, is from No Time For Flashcards). This week my kids were driving me crazy full of energy so I decided that I would replicate the spider web once again. I made a large one on our floor and the kids had a blast jumping and “crawling” all over it. My plan was to cut out some large spiders out of different colored paper and place them all over the web and have them follow my directions on which spiders to jump on. I was planning to do this after nap time/quiet time…but the kids had a different idea. They decided to rip up the whole web off the floor while I was in the other room. Sigh. At least they were working on their fine motor skills! To target artic, WH questions, etc you can either write words on the foam items (leaves, pumpkins, ghosts, spiders for the web, etc), draw pictures on them, or you can attach pictures to them. A simple way to attach pictures is to cut 4 slits in each foam item and slide the picture card in the slits. If working on articulation, you can have the student jump from word to word while saying it so many times (I usually do 5-10 times). 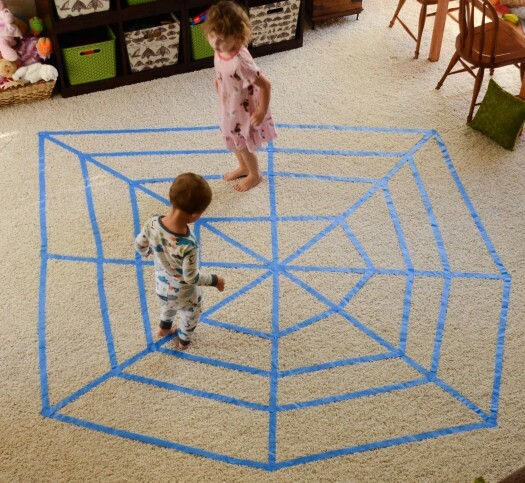 Make a spider web on the floor and do similar games with spiders all over the web. You can also just spread out picture cards over the web and have the children jump to each one and describe it, say it 10 times, say it in a sentence…etc. Want to bring in more gross motor in your therapy room or your home? You should totally check out this fantastic post at The Pleasantest Thing all about Halloween Gross Motor activities. 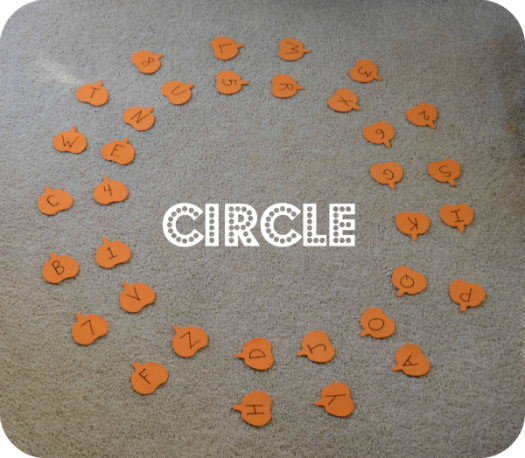 These can all be easily adapted to target speech and language skills! Pumpkin hopscotch? YES PLEASE! 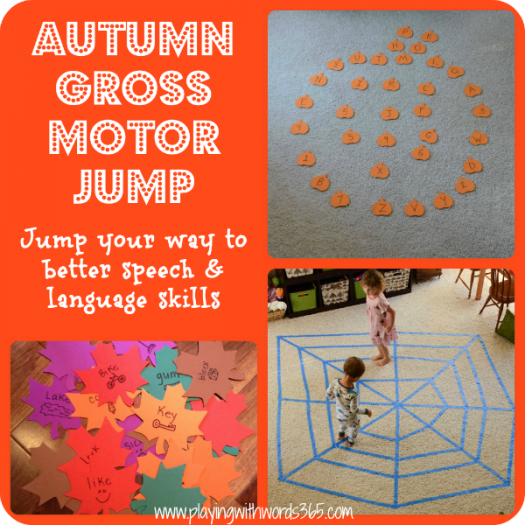 What ways do you use gross motor to target speech and language skills? Wow I love your blog! I came on over from Frugal Foodie Mama and my son just turned 3 and has speech delay…well he is doing much better now and I am getting all the help that he needs however I still LOVE new ideas to help him so your blog comes in handy! I am following you on FB as I am not too sure how to follow you on blogger…I hope you will follow me back! I’m loving all of the great ideas and information you have! I’m going to need a few weeks to read everything! I’m always looking for good ideas to use with my kids in therapy and a good resource for parents! Thanks for the time and effort you’ve put into this!! !